Dr. Murray excels at providing her patients thorough eye and vision examinations and enjoys spending extra time to counsel patients with complex issues. 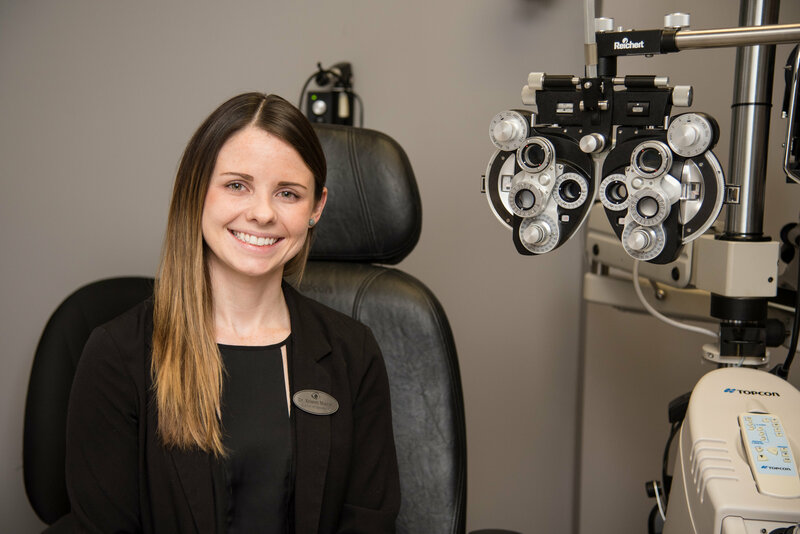 Dr. Murray is also fluent in French and would be happy to see anyone requiring or preferring an eye examination “en français”. Dr. Murray enjoys working with patients of all ages. Dr. Murray is friendly and is always excited to meet new people. She believes in building trust and openness in relationships and enjoys taking the time to determine what is best for each and every patient. Dr. Murray enjoys staying current with research on nutrition as it pertains to eye health and loves sharing knowledge on prevention of eye disease with her patients. Dr. Murray offers specialized testing for visual perception and dyslexia as well as binocular vision deficiencies. Dr. Murray finds her work involving the visual remediation of children most rewarding as she helps many children who would have otherwise needlessly struggled in school. Dr. Kristen Murray graduated with Honours with her Doctor of Optometry Degree from the University of Waterloo. She also received a Bachelor of Science Degree with Honours in Biology from the University of Prince Edward Island (P.E.I.). Despite originally being from P.E.I., Dr. Kristen Ann Murray spells her middle name Anne, without an E! Dr. Murray completed an externship in ocular disease and therapeutics at Parkland Hospital in Dallas, Texas. While in Dallas, she most commonly managed diabetic retinopathy and glaucoma, provided low vision services, and even learned a little Spanish. She has also travelled to Peru where she provided eye care for those who would not otherwise have access to such services. She enjoys learning about other countries and cultures and is currently planning her next eye care mission. Dr. Murray is passionate about the profession of Optometry and is also involved within the profession through volunteer and humanitarian work. She is a member of the Ontario Association of Optometrists, the Canadian Association of Optometrists, the Lions Club and the Volunteer Optometric Services to Humanity (VOSH) organization. When not taking care of her patients, Dr. Murray enjoys travelling the world, being outdoors, the beach, and spending time with friends and family. She is excited to grow some roots in Brant County and is looking forward to meeting you!